Tuesday, March 28. Recently, I did not take my own astrological advice and regretted it. Today, I do not want to make that mistake again. There are some rough edges on this day. Don’t think you can smooth things out easily. Like the live end of a frayed electrical wire, sparks are flying, interactions are charged. What needs to come into conscious awareness? What changes will you make? The Moon in Aries forms a square to Pluto in Capricorn and opposes Jupiter in Libra mid-afternoon (CDT). The Moon acts as a trigger for the exact square between Pluto and Jupiter. We can’t hide our secrets forever. Perhaps this transit pushes shadowy qualities into the light of day. Perhaps this is the step we needed to be reborn into fairness and balance. Although the Moon does not exactly conjoin Uranus in Aries until a little after midnight, we feel this agitation all day too. Remember the frayed wire. Wednesday, March 29. This is a good day to attempt to smooth over some miscommunications that may have occurred last week when Mercury in Aries was making challenging aspects to Jupiter and Uranus. Today, Mercury makes a supportive trine aspect to Saturn in Sagittarius. The mission may stay the same—shake up old forms and call more of ourselves awake—but we suddenly find we have more resources to get those messages across. Take care with your expression as you tap into this flow. Mercury will station retrograde next week and will connect with Saturn by trine two more times. We may be working on rethinking and repairing how we express ourselves for the next few weeks. The Moon in Taurus may also help us slow the frantic Aries energy down but try to avoid becoming stubborn about the words you need to express. Thursday, March 30. I won’t lie to you, it would be perfect if today’s square between Jupiter in Libra and Pluto in Capricorn exposes something about the current U.S. government that begins the inevitable road to impeachment. Yes, that is my politics. And that type of thing could very well happen under this transit. Jupiter wants justice in a big way. Pluto holds the reins of corrupt power systems. Pluto is funny. This god can be the force that keeps corruption in power and it can be the force that transforms it. If there is any doubt about what Pluto is going to do, Jupiter may swing the scales towards transformation. This happens in our personal lives too. What ways do you hold or avoid holding power that needs to be transformed? Healthy power is life force in proper relationship to others. We all need more of that. The Moon in Taurus conjoins Mars in Taurus. Some of us will stubbornly refuse to change. Others will put all their muscle behind making change happen. Which will you choose? March 31—Crescent Moon: Germinating. Spring is busting out all over. Or so it seems today. The seeds of awakening planted at the New Moon on March 27 burst from their shells. We may not see evidence in the visible world but change is happening below the surface. If we want to emerge with new skin into the new season, it is good to let this interior work happen first. What is calling you to burst out of your shell? Do you feel Aries confidence or Aries shyness as you contemplate the changes you may need to make now? Aries shows both of these faces to the Sun calling it out of winter slumbers. I have an Aries friend who calls this Aries quality “bold n shy.” Just like a spring day can be warm one minute and frigid the next, Aries sometimes rushes headlong into an adventure and then suddenly gets cold feet. How are you feeling today about your awakening? The Moon in Gemini creates just the tone we need to get out of our shells. This social, inquisitive sign stimulates connection. These connections help us wake up just a bit more. Mercury temporarily enters Taurus today. By April 9, Mercury will station retrograde and re-enter Aries April 20. Until then, communication styles tend to the literal. Best to say what you mean as clearly as possible. Saturday, April 1. 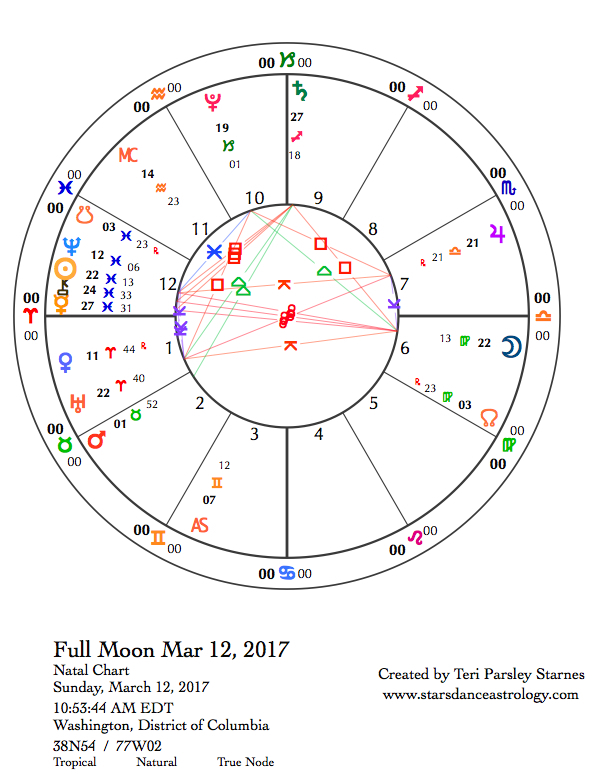 I like an April Fools’ Day that has a Moon in Gemini. We are more likely to enjoy playing the fool under this influence. Be gentle with your tricks. 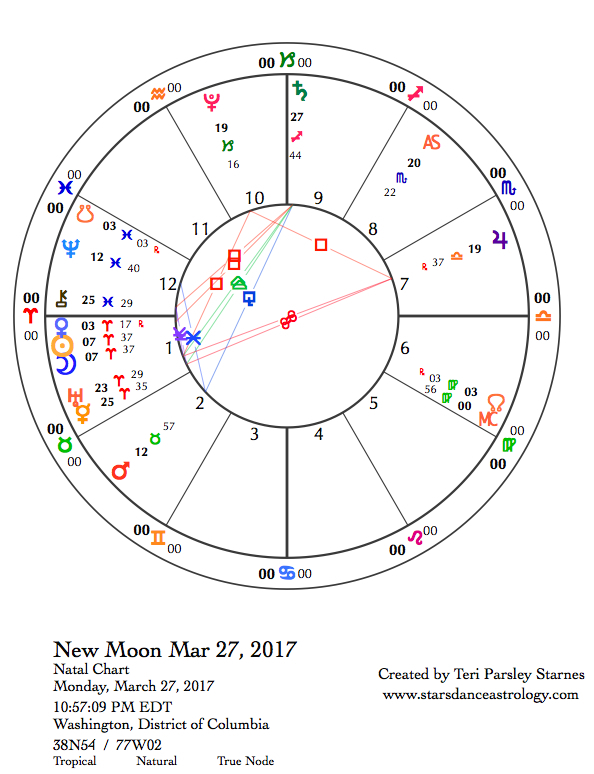 With the Moon making a square to Neptune in Pisces early in the morning (CDT), some of us may also be a little tender emotionally. Use the lightheartedness of the day to create more intimacy between friends. The Moon’s trine to Jupiter enlarges all things that center on our thoughts, ideas, and connections. Sunday, April 2. High energy lands in a quieter place today. Early in the day, the opposition between the Moon and Saturn adds a more serious contemplative tone. When the Moon moves into Cancer, the desire to nest strengthens. A big energy shift comes when Venus retrogrades back into Pisces today. On March 4, Venus stationed retrograde in Aries. Since then, Venus has added spit and fire to our interactions. Gotten into any fights? During a retrograde, we have the opportunity to rethink and internalize unconscious actions. With Venus moving into Pisces, we tune in again to how we are more alike than different. It is easier to feel others’ pain as well as their joys. Notice how this may shift your relationships again. April 3—First Quarter Moon: Sprouting. 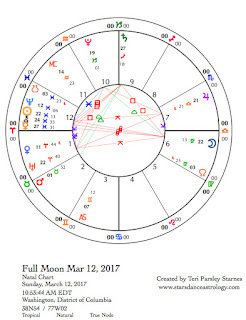 Astrologer Dane Rudhyar described the first quarter phase of the Moon as “crisis in action.” The waxing Moon encourages action and expansion. This phase is the first real correction we need to make in the momentum of the lunar cycle. Under this phase, we may need to act to meet a crisis. Using the plant cycle as guide, this phase is when the lunar seeds emerge from the ground. Just because our seeds are sprouting does not mean our lunar intentions will continue to grow. Small plants meet many challenges when they unfurl their first leaves. That is where we are now. If the intention is to awaken and scrutinize our lives under the rays of the Aries Sun, what new challenge must you meet head on? That is the Aries Ram style, you know. Butting heads is one method to meet a challenge. It may not be the best one, however. As you unfurl your leaves, take a moment to see what is really around you. This is an opportunity to practice being awake. Are the perceived threats really threats? Are you being complacent about something you really shouldn’t tolerate anymore? Being awake means we see things more clearly before we act. Awareness could come in handy since the Moon in Cancer forms a challenging grand cross formation with the Sun in Aries, Jupiter in Libra, and Pluto in Capricorn. The source of recent agitation may be re-stimulated. Be curious about how your body can regulate tension as all around you are provoked into awakening too. Tuesday, April 4. You may have noticed lately that people have been gravitating towards assertive action and thought. Perhaps that has shown up as conflict, or decisiveness, or taking leadership. There has been a lot of cardinal sign emphasis in the heavens lately. The signs, Aries, Cancer, Libra, and Capricorn are ‘take charge and lead the way’ kind of energies. Mars in Taurus, the fixed earth sign, is showing us that there are other, just as valid, ways to be. There is a quincunx aspect between Mars and Jupiter in Libra. This fixed sign slows it all down. We must remember that everything we do and feel happens within our bodies. What is your body telling you to do? It may be to change direction. Let things happen without you. Tune inward and let your body know that you are paying attention. The Moon moves into another fixed sign this evening, fire sign Leo. Over the next two days, notice the resource of energy. How will you tend yours? Wednesday, April 5. The conventional thought in astrology is that trines are supportive aspects. They happen between signs of the same element. Today, we might notice that trines aren’t always easy. Mars in earthy Taurus makes a trine to Pluto in Capricorn. I get the image of a steamroller bearing down and through obstacles. Sometimes this amount of strength and momentum is very helpful, sometimes it can be hard to make course corrections or slow down that momentum. We may notice both things today. On the fire side of things, the Sun in Aries is trine the Moon in Leo. Fire helps us burn away doubt. This can add to the feeling that we need to use our steamrollers to smash up things. To make the pressure even stronger, Saturn is stationing retrograde in Sagittarius right after midnight (CDT) tomorrow. We have high expectations. There is a fine line to walk today between passion and discernment. May we walk it well. Thursday, April 6. Saturn, near the end of the Sagittarius, turns retrograde today. Saturn will retrace 18 degrees of Sagittarian territory before turning direct again on August 13. That is a big chunk of a sign. Part of us might be feeling, aww, really? Do I have to go over that again? Saturn is the Great Disciplinarian. One could even say, the Great Party Pooper. You might be feeling that today too. The Moon in Leo tries to help with a trine to Saturn and Uranus in Aries, creating a Grand Fire Trine aspect pattern. Perhaps the purpose of retracing our steps is to learn how to harness the fire of our creativity to affect powerful and lasting change in the world. This lunar cycle is about waking up. Perhaps we can wake up to taking another step in our activism. April 7—Gibbous Moon: Budding. 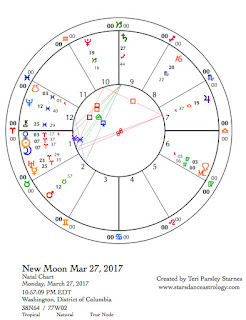 At the New Moon on March 27, we planted seeds infused with Aries potentiality. I’ve been noticing a strong impulse to awaken, to use the growing light of this Aries Sun to scrutinize myself a little more, asking myself, What needs to come into my conscious awareness? Those seeds have been developing and have reached the budding stage. We are on the cusp of seeing more about our lunar intentions. This cusp is an opportunity to re-focus and re-dedicate our efforts. Sometimes, awakening is like a lightening bolt out of the blue. We may have already experienced that kind of jolt this spring. Another type of awakening can come from long practices of inquiry and mindfulness. We may be asked to try a little harder with this type of awakening under the gibbous phase of the Moon. The Moon in Virgo contributes to the desire to have daily or regular practices that support our wholeness. The Moon trines Mercury in Taurus (another earth sign), reinforcing this desire to organize our thoughts around conscious awakening. This may be the peaceful side of the day. There is another influence that feels more like another lightening bolt. The Sun in Aries opposes Jupiter in Libra and makes a square to Pluto in Capricorn tomorrow. These planets have been pushing us to look in the shadows. Unresolved or unconscious tension could erupt into the light of day. Perhaps we need this jolt to remember why we want to awaken. This emphasis on awakening may prepare us to navigate change. Rumi, the mystical Sufi poet from the 13th century, writes about a lot about waking up. He says, “If you knew yourself for even one moment, if you could just glimpse your most beautiful face, maybe you wouldn’t slumber so deeply in that house of clay. Why not move into your house of joy and shine into every crevice! For you are the secret Treasure-bearer, and always have been. Didn’t you know?” Perhaps today, we know this a little more. It may be helpful to hold this affirmation in our hearts as the lunar cycle waxes to the full phase on April 11. Saturday, April 8. The square between the Sun in Aries and Pluto in Capricorn encourages the investigation of our shadows. Things that have been held in the unconscious for too long may surface today. This process can be scary but it is also incredibly invigorating. Something lost is found again. The Moon in Virgo contributes a desire that this unveiling be a healing process. The trick will be to avoid putting too much pressure on ourselves. Perfection is a trap. The square between retrograding Venus in Pisces and Saturn in Sagittarius could have us falling into this trap even more. It is good to negotiate with Saturn. This planet reminds us of how much we have yet to learn, but we also need to celebrate the things we have accomplished. Relationships are a prime area for the deeper work of today. Sunday, April 9. It is possible that you woke up with a feeling of being weighted down with the cares of your life. Notice if your desire for perfection is feeding this feeling. Let it go. Overnight, the Moon in Virgo opposed Venus in Pisces and squared Saturn in Sagittarius. We know there is work to do, but we don’t have to do it all today. The Moon enters Libra right after this unsettling transit. We want balance. We want options and choices and beauty. Be aware, Mercury in Taurus turns retrograde today. Mercury in this sign helps us to solidify our thoughts. But that stability may quickly disappear as Mercury has another plan for us. This lunar cycle has been about waking up. From now until Mercury stations direct on May 3 in the sign of Aries, we can’t depend on those thought processes to go just as planned. We will be waking and developing adaptability. Monday, April 10. The Full Moon happens tomorrow and we feel the agitation of it today. Agitation is not the exact word for this. There could be tension or stress involved, but there could also be anticipation of joy or resolution in this energy as well. I believe our souls need and want the release that comes with every Full Moon, even when it is unsettling. Waking up is unpredictable. The Moon in Libra conjoins Jupiter and makes a square to Pluto in Capricorn. These planets have been pushing us, tempting us, and generally inviting us to rebalance our truths around power and influence. Go deeper today into your stories around power.